St. Francois County Health Center is closed for a monthly staff meeting from 8:00 AM – 10:00 AM the first Thursday of each month. We will be closed periodically for staff training/development throughout the year. 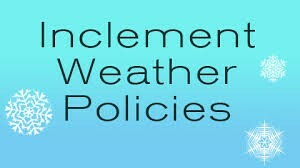 During periods of inclement weather, St.Francois County Health Center may be closed. Listen during the scheduled listing of school closings, business closings, and public office closings. The safety of our clients and their families are important to us. to determine if SFCHC is closed.